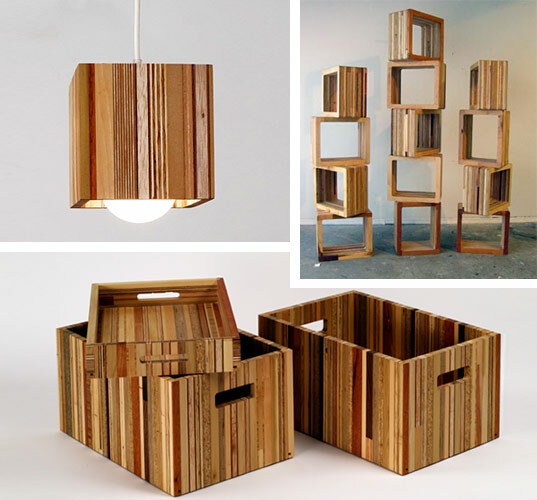 I have been enamored with environmentally conscious furniture company Scrapile ever since I came across their line of recycled wood furniture during New York Design week years ago. 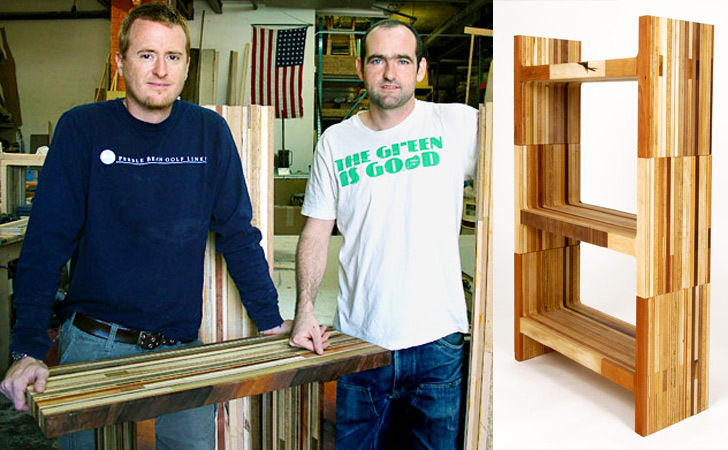 Brooklyn-based designers Carlos Salgado and Bart Bettencourt have created a beautiful, cutting-edge line of furniture by collecting wood scraps from various lumber mills and recycling those scraps (which would otherwise be headed for landfill) into their stunning minimalist pieces. At this point, the Scrapile line includes tables, benches, stool, shelving, crates and lamps, all made out of their signature striated material. I had a chance to sit down with the up-and-coming design duo at their shop in Williamsburg to learn how it all began. JILL: So what is the story of Scrapile? How did the project begin? CARLOS SALGADO: Well, I was working on a chair, and Bart helped me build it, and so I just started hanging out at the shop with Bart more and more. And literally one day Bart just came up with the idea. You know Bart has all this scrap wood in his shop, and one day we just started playing around with different ideas of what to do with the scrap. I think before we knew it, we were sketching ideas in our books. We started trying to prepare for First Stop, which is an open-studio design weekend in Williamsburg. That was two years ago. BART: We literally started Thursday night before a weekend show, came up with a bunch of different ideas and then just picked the best ones. Its funny, the best ideas we came up with then are the first pieces in the line we now call Scrapile: the rectangular boxes and the T-shaped bench. CARLOS: We had a really good response that weekend, and it just took-off from there. From that weekend alone we got invited to participate in two different shows. We got invited to show in Brooklyn Heights the following weekend. BART: From there we got picked up by a couple of different showrooms in New York and started getting some press. CARLOS: Now two years later, here we are. JILL: Did you ever have any other designs apart from the striated design which has become your trademark? I mean, did you experiment with different looks, or did you hit upon that design immediately? BART: Well, we had one other project with scrap laminates and veneers that actually went over well. CARLOS: It was really colorful, more like a mosaic. We made about 10 of those and we sold them all. They had a similar feel of mix-and-match with clean lines, but the project that we currently have out there in the market somehow seemed like a more significant project that we could really expand upon. JILL: So you pick up scraps from other building companies, but you also mill wood yourself in the shop, don’t you? BART: Yeah, the other thing we have going on in the shop is an eco-friendly, green building supplies company, which we started a little over a year ago. We wholesale and distribute bamboo plywood, wheat board, other agricultural byproducts, composite boards, green finishes. JILL: So how much of the scraps come from Bettencourt Green Building Supplies, and how much comes from other building companies? CARLOS: I’d say its about 50-50. BART: But sometimes when we go and do pickups, that number goes down to 10%. I guess it really depends. It fluctuates a lot week to week. A good example is Steinway (the piano manufacturing company) out in Astoria. It’s amazing the amount of awesome material that they get rid of. Sometimes we go and they have nothing for us; other times we show up and they have more scrap than can even fit into our van. We end up driving back to Brooklyn with the back of our van dragging in the dirt. CARLOS: We picked up ten baby grand piano tops once. Unfortunately that stuff is absolutely useless to them. JILL: Do they just give you the material for free? BART: Yeah, it’s actually helpful for them for us to remove their waste. It just ends up being less on their garbage bill. CARLOS: Yeah, we’d love to absorb it all, but we are pretty limited with space, as you can see. JILL: About how many different shops do you go and pickup materials from? CARLOS: I think right now it fluctuates between 5-8 different shops that we stop by regularly. We have one-off pickups too. People sometimes email us to come pick up their stuff. JILL: So are the glue and the finishes all green as well? CARLOS: Our glue is just regular wood glue. It’s non-toxic. We definitely make an effort to have use green finishes as well. We use a finish called Danish-Oil for most of our products. We’re researching water-based finishes at the moment, and spray-grade finishes. BART: We’ve done a few bar-tops for restaurants, counter-tops for people’s houses, which was actually pretty nice. We were a little hesitant at first when a client asked us to do it, because we thought “Are we going to end up doing lots of counter-tops?” But the piece actually came out rather beautifully. It has the same visual texture of the rest of the Scrapile work, just in a flat plane. JILL: Yeah, on that note, I was wondering if you do floors, and walls and things like that. BART: We’ve been approached by a green flooring company who knows our materials and has asked us whether or not we want to do it. We’re currently thinking about it. CARLOS: We’re going to be prototyping it at some point. BART: Obviously we have the material, but to engineer floors, we have to go back to the drawing board a little bit. Since all we have done up until now is furniture, we are not as familiar with flooring. Our current designs are based on us using the particular machines that we have in our shop. Our method won’t work with large scale manufacturing machines or any sort of mass-production. So we are trying to develop some sort of system so that the reuse of scrap wood can be done outside our shop. The reason that most lumber companies throw out so much great materials is that they simply don’t have any way of reusing them. 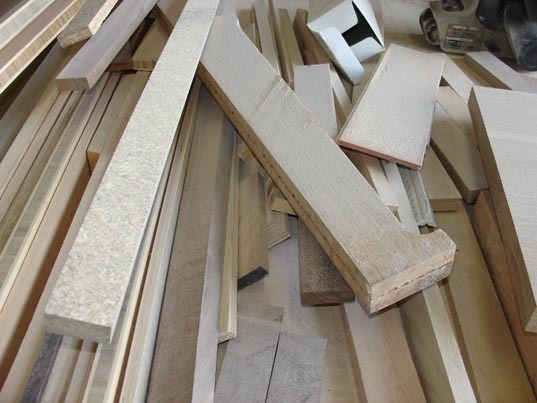 All these scraps of wood just pile up and they become a menace. You can’t keep working in your shop if you keep everything; you get trash piling up constantly. That’s what our project is about really. We want to find a way to automate this process a little more so that more people can be efficient and make better use of all the “waste” material out there. CARLOS: We’ve actually run into the problem of creating our own scrap from the Scrapile line! It seems redundant that we were trying to collect all this stuff, but then of course we are making scraps ourselves. JILL: So then are you getting smaller and smaller scraps? CARLOS: Yeah, that’s why we got the lamps, crates, and lights. Its all the smaller stuff we can make from smaller 2nd round scraps. We try to recycle everything back into the system. Its not quite 100% yet, but we’re pretty good on it. We don’t throw out much. BART: It’ll be 100% when we can figure out what to do with the sawdust. JILL: Could you press that into some type of board? CARLOS: We’ve thought about ways of trying to do that. But of course that is an energy-intensive manufacturing process. BART: It would be awesome if we could create a little machine that shops could buy; it could go with their dust collector, it could take all of their sawdust and turn it into some type of flakeboard that they could use as a building material. JILL: That’s a great idea. You should get started working on that? JILL: Did you guys start off with a mission of sustainable design, or has it just grown out of the project? CARLOS: I think with this project in particular, our biggest concern was what’s going into landfill, in terms of these boards: formaldehydes, glues, toxins. Not to mention the waste of wood. I mean obviously we can’t absorb the entire Tri-State area and keep the landfills free of that stuff, but at least we can make other people conscious of the problem, with our project, and show that these woods can be recycled. 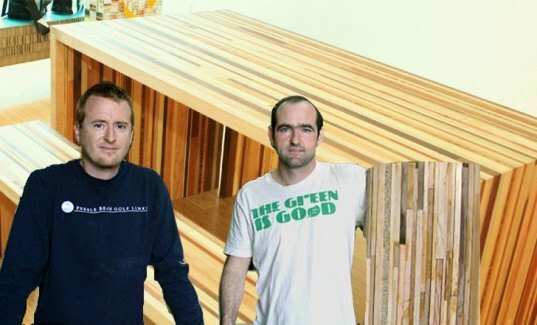 There are a lot of great hardwoods that are being thrown out, and they can be reused, and we’ve proved it. I think people working in woodshops often get this mindset that certain smaller dimensions of wood just can’t be used, but its not true. JILL: Were you always interested in environmentalism? CARLOS: With my own stuff I’ve been involved in environmental concerns for a while now. I was really involved with solar power for a while, and that sort of led me into green building. But I can’t say I was always green. I mean at the time, even when I was interested in building green, a lot of materials just weren’t available, and when they were they were just so expensive it wasn’t feasible. BART: Philosophically, environmentalism is definitely the most important thing in this for me. When I started learning about furniture design and all the materials that go into it, I just started getting really turned off by the industry standard, what was available, and particularly what was available in New York. Carlos actually brought some “green” sample materials by the shop one day, and we immediately started researching the field. I sort of plugged him into the furniture that I was making, and we just started making a push to replace the environmentally damaging materials that were being used. 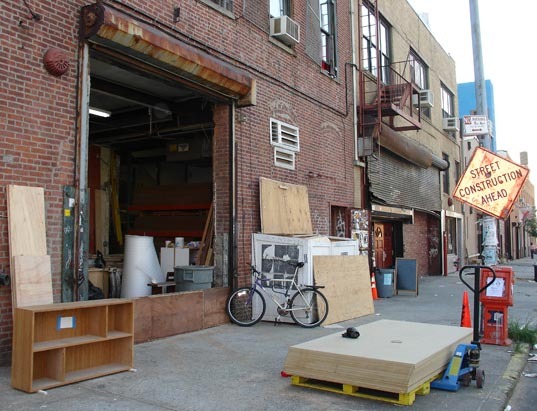 JILL: I’ve heard people describe Brooklyn as a hotbed of the salvage / reuse movement. Would you say there is a movement going on that is particular to Brooklyn or to Williamsburg? CARLOS: I don’t know. I think that this attitude has always been in the neighborhood even back before this area was gentrified. I mean its almost like thrift recycling furniture for your next apartment. That’s always been the case with artists and people who have no money. BART: Even just recycling spaces. There are all these bars that are named after their original occupants, you know? CARLOS: Yeah, I think in some ways that has always been here. On top of that, this is probably the most industrial and toxic area that we are sitting on in New York. I think that has made people conscious of trying to make things better. JILL: Back during New York Design Week in May, you guys were involved in putting on that event in Brooklyn called “A Little Green”, that featured a number of other designers from the area. Who are some of the other designers you work with? Can you recommend other designers and shops in the area that are pushing the green front? CARLOS Actually, a lot of the other designers in that show weren’t necessarily “green”, but we managed to convince them to do green pieces for the show. BART: Yeah, with a lot of them, we invited them to participate: either by starting with some green materials that we gave them, and doing a project specific to that show. Or some of them, we gave them green materials to plug into their formula for pieces that they have already designed. For example, Design Can made their Parcel Table out of sunflower seed composite board and bamboo plywood. Redstr/collective started using enviroboard for that show, and they are still using it now. They started getting into the materials that we were getting into, and now there are a lot of green materials in their line. CARLOS. 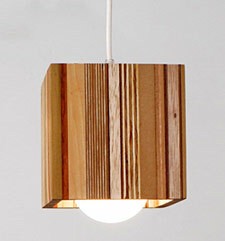 Not everyone works with wood, so its not always so easy to rethink the whole design process. A lot of materials out there, like plastics, really need to catch up. BART: Also, with a lot of green building supplies, they exist, but they really just aren’t that readily available; that’s really the whole idea behind Bettencourt Green Building Supplies. We started the company that we wish existed when we started it, so that green materials would be available in New York to actually pick up instead of paying crazy premiums for small amounts of materials to be shipped to you. JILL: Does Bettencourt Green Building Supplies deal with anything other than wood? BART: We sell finishes, adhesives. We’ll have to see where it goes after that. CARLOS: We’re looking at everything. We are going to get started on Scrapile wallpaper. I think we just found a source in an email today. Its not really wood, but it looks like wood in a wallpaper. BART: It will be like the new wood paneling. JILL: That sounds pretty cool. CARLOS: We’ll have to see how it goes. JILL: That funny, when you first mentioned this I was actually imagining you recycling old wallpaper in stripes. I think that would be cool too? So, anyways, you?ve done interiors for restaurants and things like that? CARLOS. Well, Bart did all the chairs for this organic restaurant in Chelsea. BART: Yeah, it was for a restaurant called Cookshop. I think Cookshop, or maybe another restaurant by the same owner. The owner came by the Brooklyn Design booth during design week. He was originally going to buy his chairs from Design Within Reach, and he instead ended up buying from us. JILL: Nice! That’s a coup for you guys. BART: Yeah, scooped a job from DWR! How often can you beat their price point? CARLOS. I know man. That was like David and Goliath. JILL: Have you got any people commissioning you for custom projects? BART: We’ve got some custom jobs for pieces here and there. A couple big design studios have asked us if they can just purchase the “Scrapile” wood off us, so they can create their own designs from it. CARLOS. But the problem is then we can’t control what happens to the wood. They wouldn’t give us credit, and who knows how the wood would end up being used. BART: Yeah, it puts us in a weird position, because we make this material, but also design furniture. JILL: So you don’t sell the material by itself? CARLOS. Not yet. We might do it in the future after we get out there a little more, and get a little more legal protection. BART: And also, this project is only 2 year old. We want to have made the material for longer than that before we start selling it to people to use, so we know what happens to it in five years, you know? JILL: Okay, so you do have any new pieces that you want the public to know about? JILL: Okay, well thanks so much for taking the time to do this interview. I love your work, and I know I’m not the only one. I think people are going to be really interested in learning more about it. hi we love your crative design.our company is in turkey(istanbul) we wait for come for meet you. :) u can look our web site for work. We would love to be considered for your site! piece lily products are one of a kind and handmade from recycled or reclaimed fabrics. Our offerings include unique handbags, scarves, and pillows. The materials are literally pieced together to utilize even the smallest scraps of fabric, making each item quirky and unexpected. Thanks for your consideration! Beautiful stuff. I love seeing green and sustainable projects on here. I wonder if they go after construction waste, too. That'd probably be a different line entirely, but could make for some lovely stuff with a rougher look.